In 1999, Buzzfeed's Josh Fjelstad really, really wanted an N64. And hey, it was 1999, so did a lot of kids. But what Josh did to actually get one was... different. 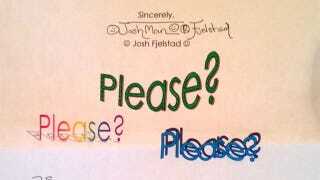 Instead of just asking, or sulking, or whatever else kids do to try and get their way, Josh sat down and wrote a letter. He made a pretty strong case! One which the clip-art at the end completely undermines, but hey, he was a kid. And it worked. A week later, he got his N64.